The Swiss maestro was tested by Daniel Evans. Defending women's champion Caroline Wozniacki powers past Johanna Larsson. 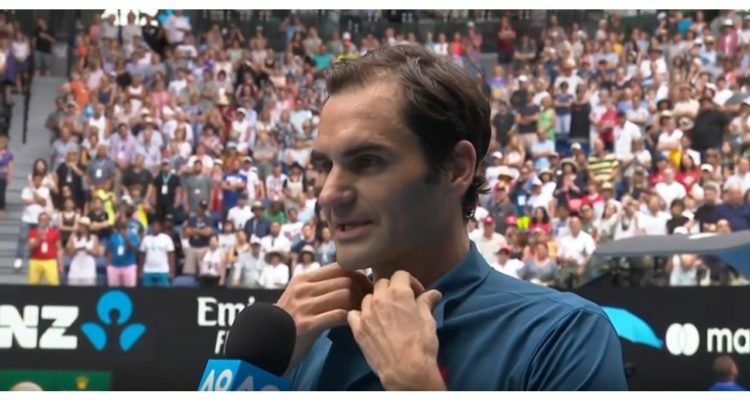 Defending Australian Open champion Roger Federer advanced to the third round with a 7-6(5), 7-6(3), 6-3 win over British qualifier Daniel Evans in Wednesday’s day match on Rod Laver Arena. Federer continued his strong form against players that have battled through the qualifying stages. The Swiss maestro has lost just one of his 27 meetings with qualifiers at the Grand Slams – to Mario Ancic at 2002 Wimbledon. Federer hit 56 winners and capitalized on two of his five break point opportunities to prevail after two hours and 35 minutes. Frances Tiafoe reached the third round in Melbourne for the first time and equalled his best Grand Slam performance by knocking out No. 5 seed Kevin Anderson of South Africa on Margaret Court Arena. The 20-year-old US-American withstood 13 aces, breaking his opponent’s serve four times to seal a 4-6, 6-4, 6-4, 7-5 victory in just under three hours of play. Tiafoe advanced to the second round after defeating Indian qualifier Prajnesh Gunneswaran on Monday. This is the youngster’s third Australian Open appearance and his 12th Grand Slam overall. Tiafoe will next face Andreas Seppi, who eased past Australia’s Jordan Thompson 6-3, 6-4, 6-4. “I dug insanely deep… It’s all about competing. Guys are so good, it’s just how bad do you really want it? I wanted it real bad,” Tiafoe said. In the women’s draw, defending champion Caroline Wozniacki extended her winning-streak at the Australian Open to nine matches. The No. 3 seed from Denmark powered past Swedish veteran Johanna Larsson 6-1, 6-3 on Margaret Court Arena. Wozniacki could next face 2008 Australian Open champion and fellow former World No.1 Maria Sharapova, who plays Rebecca Peterson of Sweden in the night session. Aryna Sabalenka defeated Katie Boulter 6-3, 6-4. The No. 11 seed of Belarus, who lost in the first round last year, hit a barrage of aggressive ground strokes which proved too strong for the British youngster. Sabalenka closed out the match after one hour and 13 minutes. “I just focus on each match. I just go match by match and we’ll see. I’ll do my best and who knows what will happen. I just try to do better every match, improve all things and work harder. That’s enough,” Sabalenka talked down her Australian Open chances.